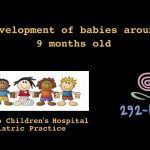 Motor Skills for 1-Year Olds – Child Life Specialist, Wendy Lane from GCHS, specializes in emotional and developmental progress from birth to adolescence. In this video she has baby “Jack” show a number of games and toys that help children learn at this age. Time 25 minutes. Preventing Child Sexual Abuse – Mary Whittier from the National Center for Missing and Exploited Children shares advice and strategies for protecting your child from sexual abuse. Time 24 minutes.